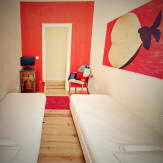 We Love F. Tourists is a modern and cozy hostel located in center of Lisbon! 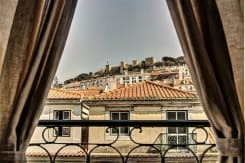 With our panoramic balcony and our 6th floor penthouse view of the Castelo de S. Jorge, the warm views of Lisbon are yours to taste and touch. Ensuring easy walking distance for shopping, restaurants, museums and parks, as well as the bar and nightlife of the traditional Alfama neighborhood. 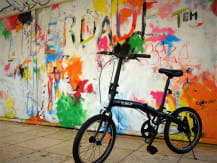 The wilder Bairro Alto and Cais do Sodré are 5 minutes away from our door. We're Lisbon… and We Love F****** Tourists! Breakfast available but not included in the price. Our reception is open 24/7. No age restrictions. No pets allowed. Passport has to be showed at the check-in. Stay has to be payed at the check-in. No drinking or smoking in the rooms. Max. period of stay (10days). From the 1st of January 2019 a city tax of 2 EUR per person, per night is not included in the total price and should be paid on site. This tax is charged to guests aged 13 and older. It is subject to a maximum amount of 7 EUR per guest. The hostel is located in a recently modernly renewed building, placed centrally in Baixa (downtown) area of Lisbon. Right on the corner of what is historically the most important commercial square of the city. The twin squares; Praca da Figueira and Rossio.